Nowadays, internet is getting polluted by lots of malware and other deadly threats due to which our computers are more prone to get infected. Hackers develop certain programs that appear like antivirus programs but they actually aren’t. These programs are the root cause of malware, virus and torjans in your computer. To get rid of such stuffs there’s a small tool known as Remove Fake Antivirus. 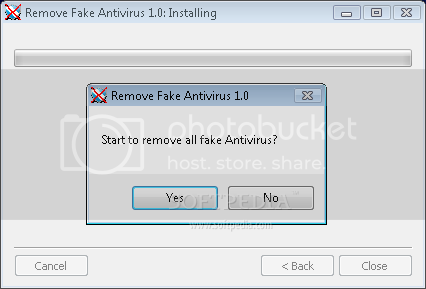 It removes several fake antivirus programs like Cyber Security, Braviax, Alpha Antivirus, Green AV, Windows Protection Suite, Total Security 2009, Windows System Suite, Personal Antivirus, Anti-Virus-1, Spyware Guard 2008, System Guard 2009, Antivirus 2009, System Security, Antivirus 2010, etc.